Fluid Guidelines: Where do we start? Fluid prescribing has been shown in the UK to be associated with significant morbidity and mortality: it has been estimated that up to 20% of patients who receive intravenous fluids suffer iatrogenic harm as a result. It is therefore an area in which investing some effort in improvement is likely to prevent a great deal of patient harm. There are now national guidelines in the UK for IntravenousFluid therapy in Adults, the NICE Guidelines. In our large district general hospital in Fife, Scotland, wedeveloped a local version of these guidelines and have implemented them over a number of years through several steps. In this workshop the pitfalls and challenges of introducing large-scale change such as this will be examined and suggestions made as to how you may be able to effect change in this rewarding and immensely important area of healthcare. To discuss the challenges and rewards of implementing guidelines in a hospital. To learn about a suggested process for improving fluid prescription and charting. Who will do it? What to look at? How much fluid, which fluid did patients get? Any evidence of assessment? Why? How long for? Amounts of Na/CL/K given? How prescribed? By whom? How is it done i.e. pile of charts given to doctor? Prescribed over weekend, overnight, any senior input, any information in notes? Fluid balance charts – are they uniform across organisation? Fit for purpose? Are prescription and balance charts filled in accurately? Are there any incident reporting systems? Barriers to change: Resistance to change amongst consultants, Time of group to implement change, funding?, Prescription - culture – not important, most junior to prescribe, not on ward rounds, nothing about fluids on clerking sheets, different charts between areas, blank charts, juniors given charts by nurses without knowing patients, lack of guidance re stopping monitoring, lack of education, doctors from different universities/hospitals, poor decision making, lack of experience in junior doctors/lack of interest senior doctors? FB charting: time-consuming, lack of knowledge of volumes, low staffing levels, too many unnecessary charts, criteria for FB charts, attitude – understanding, culture – attention to detail without understanding implications, different charts in different areas, leadership, practicalities – where do you keep the chart, how accessible is it? Paper or electronic? Different systems between areas. Is it discussed at handover? Lack of education in nursing/health care assistant population. Design of Charts: PDSA cycles Start with 1 ward, 1 patient, 1 nurse, 1 chart – ask for comments, change – may repeat with other nurses/patients, then go up to 5 – if reliable for 5 likely to work. Organise a launch day: Let everyone know what is happening. Publicity – emails, posters, stands, newsletters. 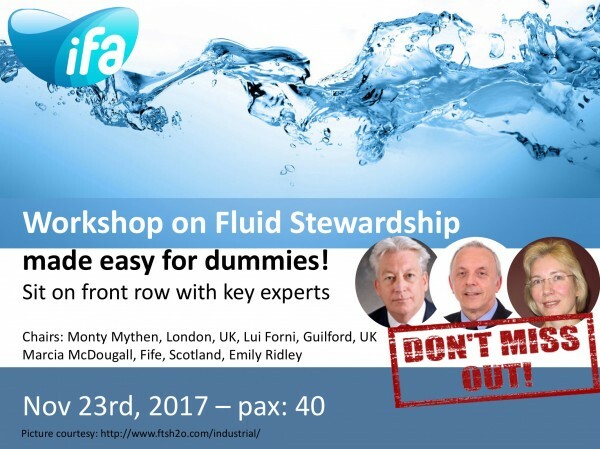 Monitoring – audits – what to audit, feedback of audits to staff, recording of incidents, publicity to hospital, data, run charts, communication between fluid group and wards, sustainability – ‘ train the trainers’ How does it remain a priority for the organisation, monitoring fluid use. ER to show audit and how feeding back to staff now. Emily to talk about PDSA testing of charts, teaching sessions for nurses and audit. Fluid charts, guidelines, AKI poster, Stop and Think poster, Criteria poster, Dehydration/overhydration poster, volume guides, Hydration matters, 30 mini cards of both types, Questions Answered, 30 of everything. National Confidential Enquiry into Perioperative Deaths report 1999. Extremes of age. de Silva AN, T. Scibelli, MA Stroud et al. Improving peri-operative fluid management in a large teaching hospital: pragmatic studies on the effects of changing practice. Proc Nutr Soc (2010), 69, 499-507. Shaw AD et al. Major complications, mortality and resource utilization after open abdominal surgery: 0.9% saline compared to Plasmalyte. Annals of Surgery. 2012; 255 (5): 821-829. Leech R, Brotherton A, Stroud M, Thompson R. Analysis: It’s time to take nutrition and fluid balance seriously. BMJ 2013;346:22-2.